UPDATE 2: The Department of Public Works and Highways (DPWH) has reopened the Estrella-Pantaleon Bridge last September 25, only a few days after it was closed to motorists on September 23. In a letter to the MMDA, the DPWH said that it will defer the closure of the bridge to January next year. "Due to public clamor and apprehension of the business circle that the timing and closure will cause possible huge economic loss specially this coming holiday season, we are constrained to defer the implementation of the project and decided to proceed by first week of January 2019," wrote the letter as seen on a Rappler article published September 25. UPDATE 1: In an official statement published on its website last September 20, the Metropolitan Manila Development Authority (MMDA) announced that the Estrella-Pantaleon Bridge will officially be closed to motorists beginning Sunday, September 23, at 8:00 AM. In the statement, MMDA General Manager Jojo Garcia warned that the repair is expected to worsen the traffic in EDSA due to the rerouting of thousands of vehicles daily. "An average of 100,000 vehicles traverse the bridge on a daily basis," said Garcia in the statement. "We are talking about 5,000 vehicles per hour here." The Estrella-Pantaleon Bridge, which connects Estrella Street in Rockwell, Makati to Barangka Drive in Mandaluyong, may be closed to traffic by as early as next week. The Philippine Daily Inquirer quoted Virgilio Castillo, project director of the roads management cluster under the Department of Public Works and Highways (DPWH), as saying that the bridge is tentatively set to be closed by Thursday, September 20. However, the article noted that the date could still be changed depending on feedback from the Metropolitan Manila Development Authority (MMDA). The Inquirer also said that the closure is seen to affect around 40,000 vehicles that pass through the bridge each day, which is much more than its expected daily capacity of 20,000. The closure will give way to the construction of a new bridge that will cost around Php1.2 billion. It will have four lanes and span over 500 meters. It is expected to be completed by 2020, which means that the bridge will be closed by around 30 months. This bridge project is one of the two announced last July by DPWH Secretary Mark Villar. Construction will be funded by grants from the People’s Republic of China. 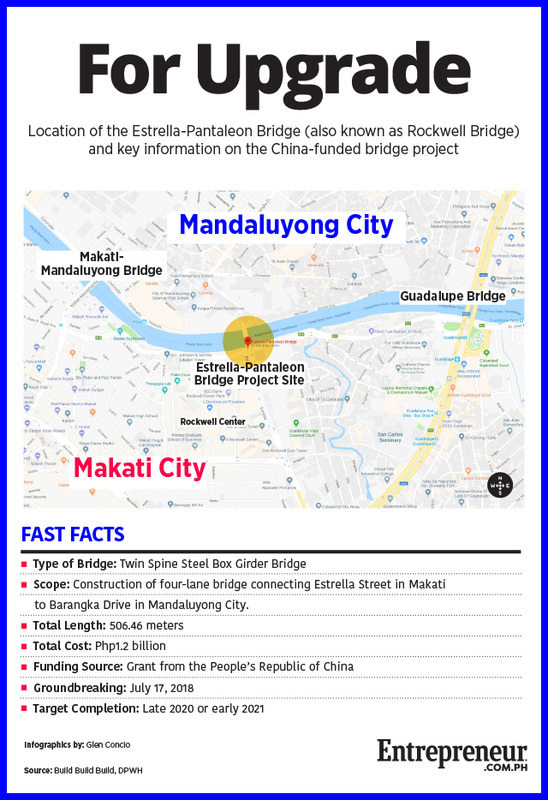 The other project, called the Binondo-Intramuros Bridge, will cost Php4.2 billion and is also targeted to be completed by 2020. Both bridges are part of the Metro Manila Logistics Improvement Network, which aims to build 12 new bridges around the region to help alleviate traffic.